A decadent, heavenly delicious French toast filled with a light, lemony cream cheese filling. 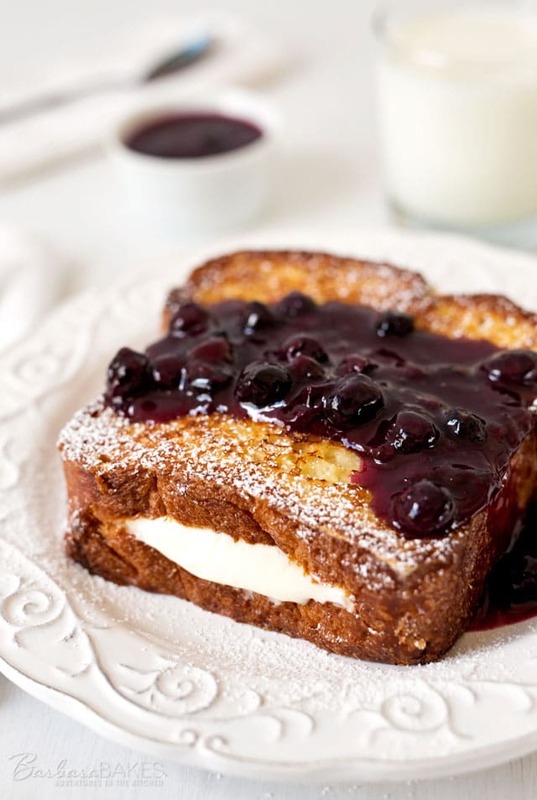 It’s made with a fabulous brioche bread and served with a sweet, tart blueberry compote. My favorite breakfast spot is Eva’s Bakery in downtown Salt Lake City. 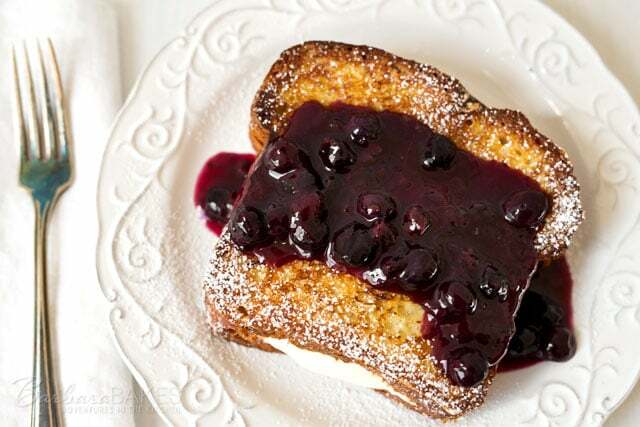 They make a Lemon Cream Cheese Stuffed French Toast with Blueberry Compote that is the best French toast ever! I decided I had to recreate it for my family at home. To make great French toast, you need to start with a great bread. I decided to go all out and bought the brioche bread Eva’s uses to make their French toast. Eva’s sells their brioche at the Liberty Heights Fresh market. It’s a rich, buttery, light as air bread. You could also use a challah if you can’t find a good brioche. The blueberry compote is super easy to make in the pressure cooker. I posted my Pressure Cooker Blueberry Compote recipe on Pressure Cooking Today. I made the compote with frozen blueberries, but you could use fresh as well. You could also make it on the stove if you don’t have a pressure cooker. Eva’s slices the bread into very thick slices, so one piece of stuffed French toast is a generous serving. The filling is not cooked in the French toast. So be sure and cut a pocket in the slice of bread before you cook the French toast, so you’re not trying to cut hot bread. My homemade version of Eva’s Lemon Cream Cheese Stuffed French Toast was just as good, if not better than Eva’s. You definitely need to make this for your family too. Prepare Cream Cheese Filling: In a small mixing bowl, beat cream cheese, lemon curd, and sugar until smooth. Add cream and vanilla and beat until soft peaks form. Put filling into a piping bag fitted with a small round piping tip and set aside. Preheat a griddle to medium heat about 350°. Slice the bread into six 1.5 inch thick slices. Cut a slit in the bottom of each slice of bread to create a pocket to fill with cream cheese filling after cooking. Whisk together eggs, cream, milk, vanilla, sugar and salt. Dip bread slices into the mixture. Flip bread and soak second side. Coat the griddle with butter and fry until golden brown on both sides. Fill the pocket in the French Toast with cream cheese filling. Place on serving plates and spoon blueberry compote over the top. Finish with a sprinkle of powdered sugar. Barbara – I made your lemon cream cheese stuffed French toast this Christmas morning with the blueberry compote. Everyone loved it! This will be our new favorite breakfast! Thanks Denise! It’s the perfect choice for Christmas morning. It’s always a hit at my house too! Hope you’re new year is off to a great start. THis is genius! What a delicious idea and so easy to make, thanks for another one of your great breakfast recipes! This looks so good! You make me drool over it. I wish I could grab it from the screen. Why is this so tempting? :)) Yummy toast! Thanks Kristy! Wish I could share it that way too. 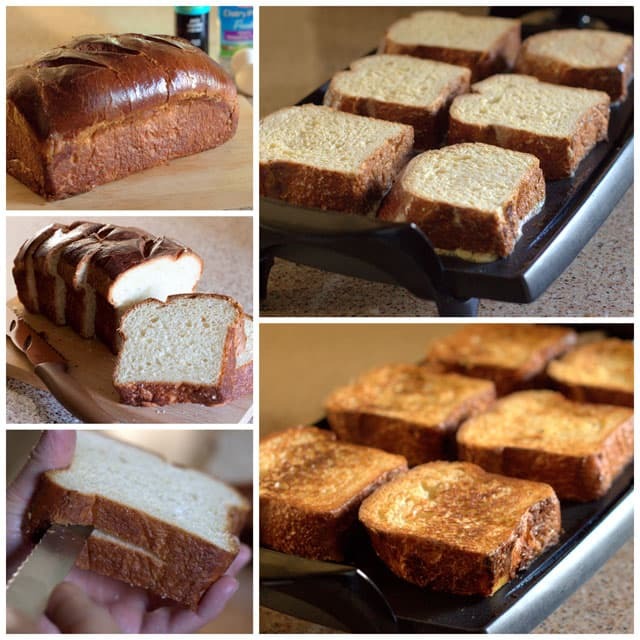 wow–I’ve always wanted to make stuffed French toast–you’re my encouragement and hopefully catalyst to try!